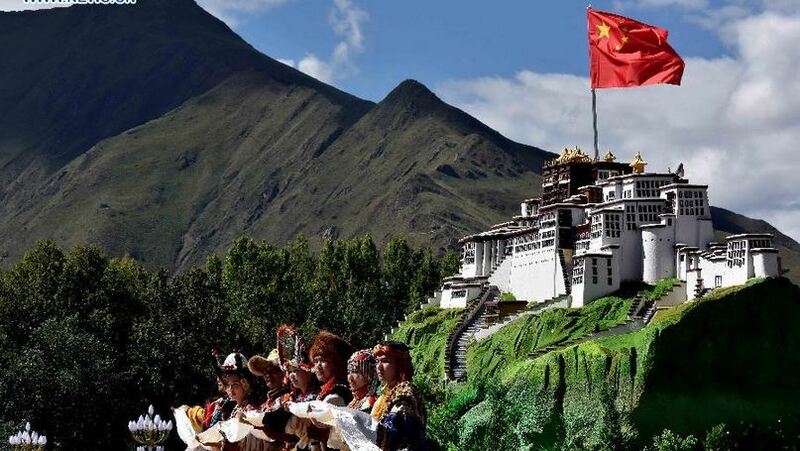 (TibetanReview.net, Sep09, 2015) – China has stressed a self-contradictory point that Tibet Autonomous Region (TAR) could be autonomous only if it is led by the Communist Party of China (CPC) leadership, according to a report by China’s official Xinhua news agency Sep 8. The remark is contained in a message sent by the Central Committee of the CPC for the 50th anniversary celebrations on Sep 8 of the establishment of the TAR. The Xinhua report said the Chinese central authorities had sent a congratulation message for the founding anniversary, stressing that the CPC leadership is the only way for Tibet to realize real autonomy. “Only by sticking to the CPC’s leadership and the ethnic autonomy system, can Tibetans be their own masters and enjoy a sustainable economic development and long-term stability,” the message sent by the CPC Central Committee was quoted as saying. A day before the grand parade marking the founding anniversary, Politburo Standing Committee member Yu Zhengsheng had called on the Chinese army, police and judicial staff in the TAR to fight a protracted battle against the ‘14th Dalai clique’, said a Xinhua report Sep 7. The term is used to refer to all Tibetans who criticize or oppose the Chinese rule in Tibet. Speaking to a rally of representatives from the People’s Liberation Army, the paramilitary People’s Armed Police Force and the judicial organs in the TAR, Yu, who is also the chairman of the National Committee of the Chinese People’s Political Consultative Conference, urged them to specifically crackdown on the separatist forces and strengthen social management, the report said. Yu, who led a 65-member delegation from the central Chinese government for the anniversary celebrations, had echoed President Xi Jinping’s recent remarks that Tibet affairs matter in the national strategy and play a special, significant role in consolidating national unity, ethnic solidarity and the Communist Party of China’s (CPC’s) governing status. China never made a prior announcement of the date for the holding of the anniversary celebrations while taking stringent security measures, including with large-scale troop movements and tourism restrictions.